Rod Taylor Movies: The Time Machine, First Australian Hollywood Star? 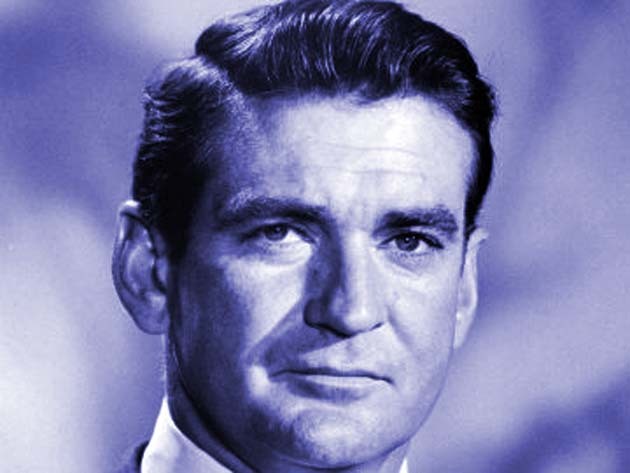 Rod Taylor, best remembered for the early 1960s movies The Time Machine and The Birds, has died. Taylor suffered a heart attack at his Los Angeles home earlier this morning (Jan. 8, '15). Born on Jan. 11, 1930, in Sydney, he would have turned 85 on Sunday. After experiencing World War I and World War II, Wells decides to fast forward to the distant future, ultimately arriving at a place where humankind has been split into two: the monstrous Morlocks and the sweet, Germanic-looking Eloi. Love blooms once Wells meets the Eloi Weena – played by Yvette Mimieux, who, coincidentally, is turning 72 today. Directed by George Pal, The Time Machine remains one of the most captivating sci-fi movies ever made. Taylor delivers a strong, commanding performance as Wells – a tad hammy, maybe, but that's part of the movie's charm; not for a moment does the star turn his old-fashioned hero into a risible caricature. Somewhat surprisingly, The Time Machine was nominated for – and eventually won – a single Academy Award: Best Special Effects (Gene Warren and Tim Baar). 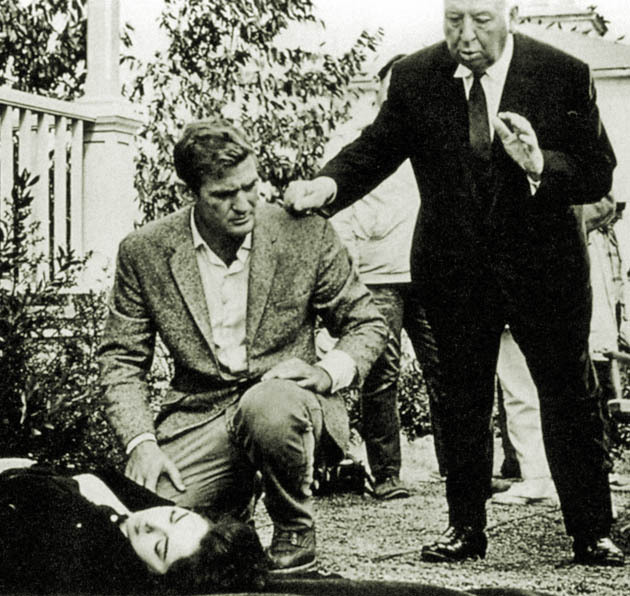 Rod Taylor on the set of 'The Birds,' with Alfred Hitchcock and Suzanne Pleshette (on the ground). Three years after The Time Machine, Rod Taylor would be cast in another seminal movie of the '60s: Alfred Hitchcock's thriller written by Evan Hunter from Daphne Du Maurier's novel about nature turning against humans: The Birds. Hitchcock discovery Tippi Hedren, who was to have become the director's new Grace Kelly, stars as a woman who, for unclear reasons, attracts the hatred of birds in the Northern California coastal town of Bodega Bay. Like most of the film's cast – which includes Veronica Cartwright, Ethel Griffies, Charles McGraw, and future Best Actress Oscar winner Jessica Tandy (Driving Miss Daisy, 1989) – Taylor is little more than human decoration in The Birds, helping a heroine in distress in one scene, arriving too late to help another heroine in distress in another. The sole exception: Suzanne Pleshette, who miraculously succeeds in creating a well-rounded character. However badly dated many of its special effects and however ineffectual the acting of most of its players, The Birds – a Hollywood color production accessible on television for decades – remains one of Hitchcock's best-known and most widely admired movies. He was one of various stars featured in Anthony Asquith's The V.I.P.s (1963), along with Elizabeth Taylor, Richard Burton, Orson Welles, Elsa Martinelli, Maggie Smith, and Best Supporting Actress Oscar winner Margaret Rutherford. He was a Nazi-in-disguise in George Seaton's clever thriller 36 Hours (1964), with James Garner and Eva Marie Saint. He was playwright Sean O'Casey a.k.a. Johnny Cassidy, torn between Maggie Smith and Julie Christie in Jack Cardiff's Young Cassidy (1965). Rod Taylor provided the voice of the dalmatian dog Pongo in Walt Disney's 101 Dalmatians (1961). He was featured opposite Doris Day in Ralph Levy's Do Not Disturb (1965) and Frank Tashlin's godawful comedy The Glass Bottom Boat (1966). He had one of the key roles in Michelangelo Antonioni's highly controversial critique of American society's mores and values, Zabriskie Point (1970), admired by some as a misunderstood masterpiece, reviled by others for its meandering pace and “left-wing” politics. Mark Frechette and Daria Halprin were the leads in this tale about youth vs. The Establishment. He played Winston Churchill in Quentin Tarantino's international hit Inglourious Basterds (2009). 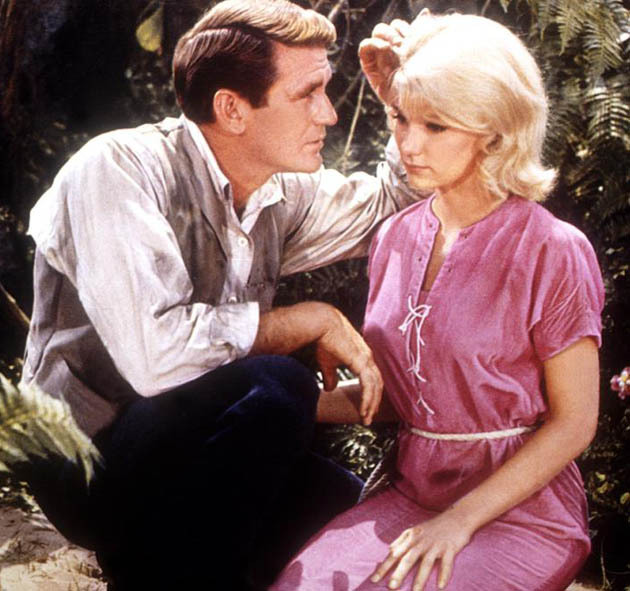 Rod Taylor in 'The Time Machine,' with Yvette Mimieux. First Australian actor to make it in Hollywood? Silent era actresses Enid Bennett (Douglas Fairbanks' leading lady in Robin Hood, Ramon Novarro's in The Red Lily) and Mae Busch (Foolish Wives, Souls for Sale, and later a foil for Laurel and Hardy). 1932-33 Best Actress nominee May Robson (Lady for a Day). 1930s–1950s star Errol Flynn (Captain Blood, The Adventures of Robin Hood). * Here are a few more post-Rod Taylor Australians in Hollywood: Olivia Newton-John, Nicole Kidman, Simon Baker, Naomi Watts, Chris Hemsworth, Liam Hemsworth, Heath Ledger, Judy Davis, Hugh Jackman, Sam Worthington, Rose Byrne, Guy Pearce, Anthony LaPaglia, Xavier Samuel, Russell Crowe, and Emilie de Ravin. Yvette Mimieux and Rod Taylor The Time Machine image: Paramount Pictures, via Cineplex. Image of Suzanne Pleshette, Alfred Hitchcock, and Rod Taylor on The Birds set: Universal Pictures, via The Hitchcock Zone.